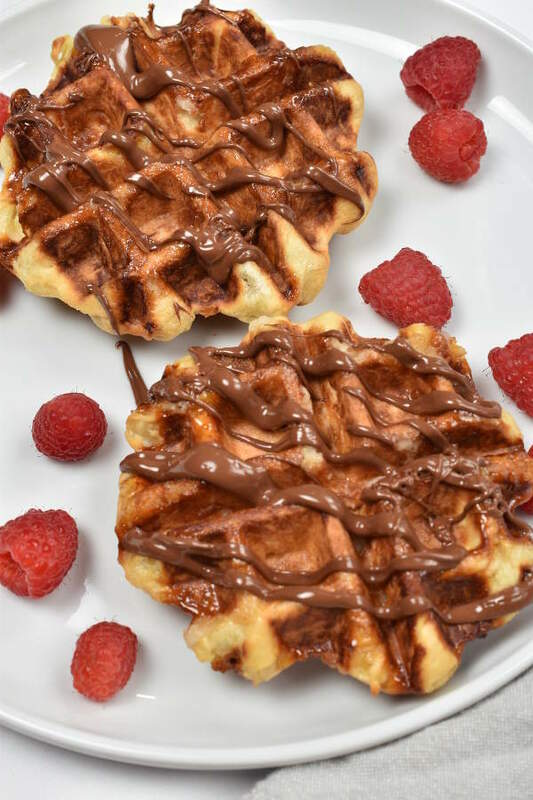 Liege Waffles, from the Belgian city of Liege, are made with a brioche-type yeast-leavened dough and Belgian pearl sugar. Liege waffles are slightly crunchy on the outside from caramelized sugar and flaky and buttery on the inside. They are flavored with vanilla and speckled with crunchy bits of pearl sugar throughout. 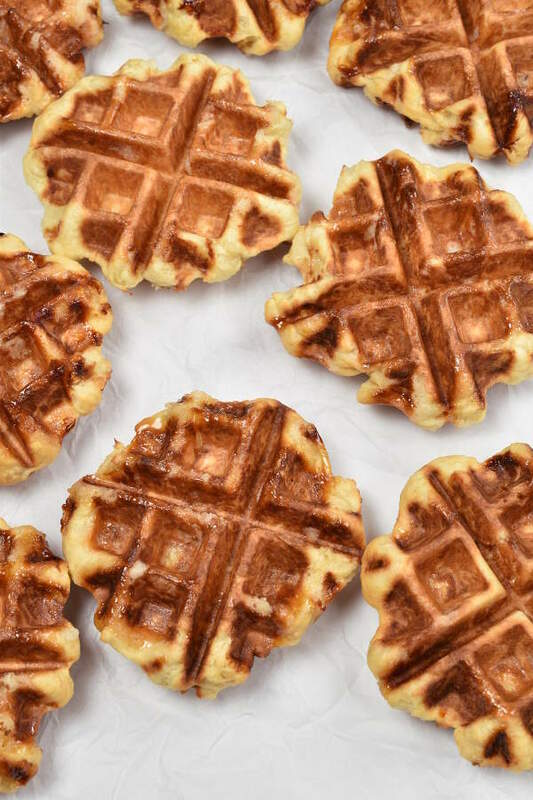 Enjoy these indulgent waffles for breakfast, dessert, or a snack. 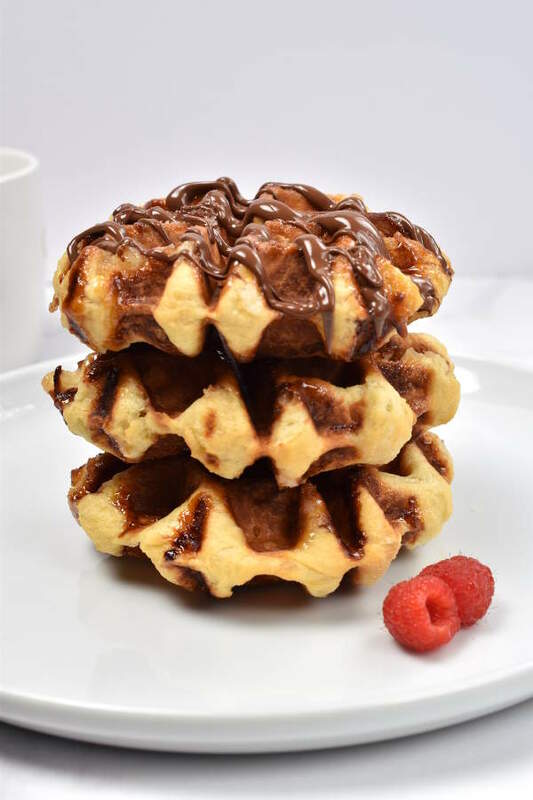 Liege waffles are sweet enough to eat without any topping, but a little Nutella or melted chocolate never hurts. 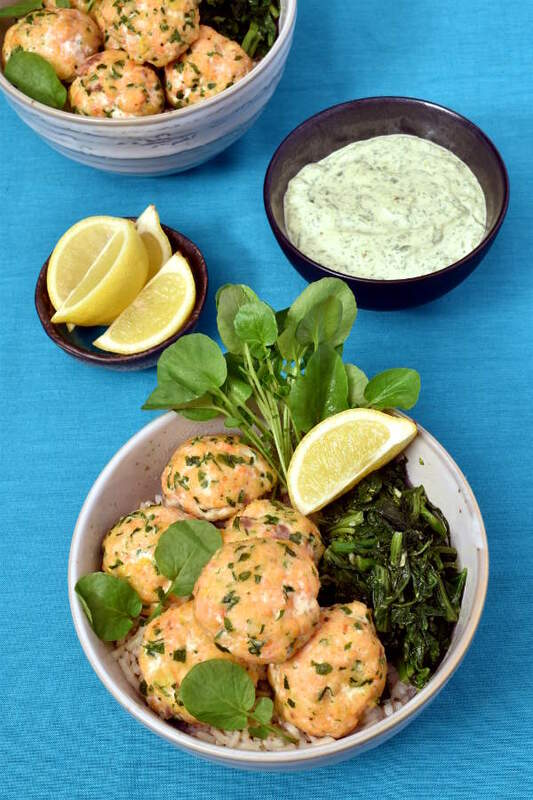 Hello, and welcome to one of my favorite recipes on the blog to date. 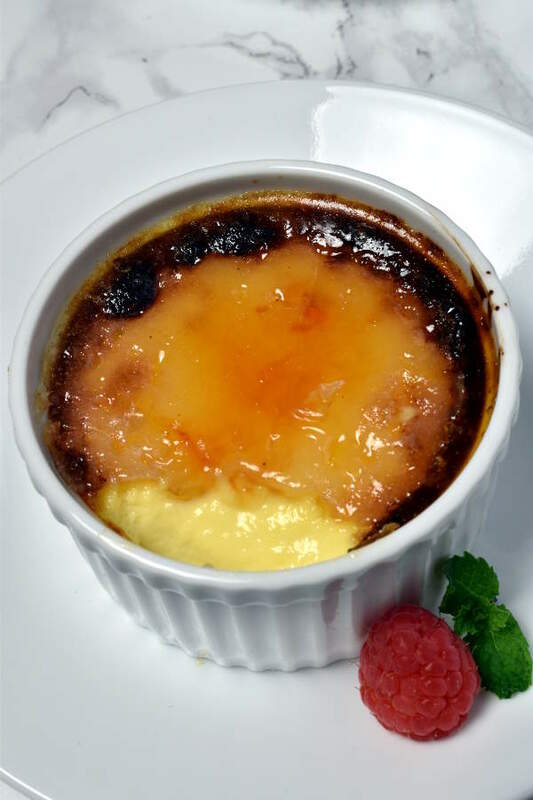 With Valentine’s Day coming up, I’ve started thinking about romantic breakfasts and desserts. 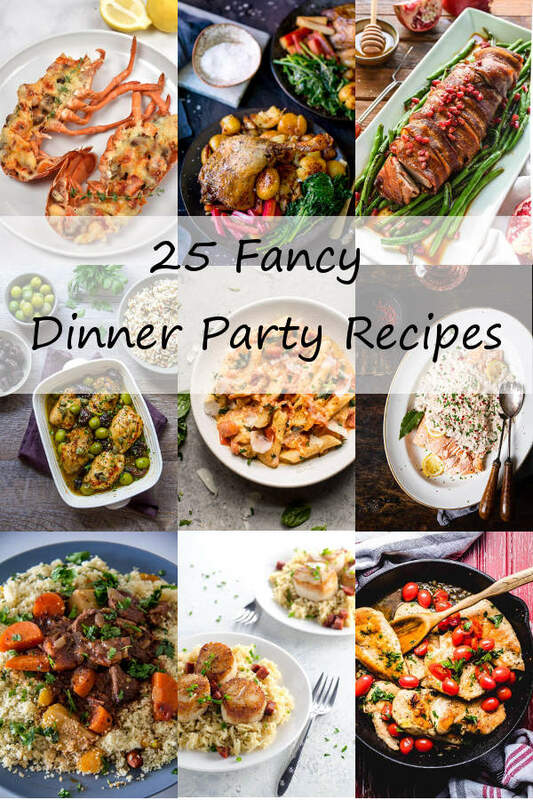 (And dinners too… who are we kidding.) Although it’s on a weekday this year, I see no reason not to stretch the celebration into the weekend with a sweet and luxurious breakfast. We talked about Engagement Chicken before, but is there such a thing as engagement waffles? Because these waffles are good enough to make someone fall in love with you. What are Belgian Liege Waffles? Liege Waffles, dating back to the early 19th century and possibly earlier, are from the city of Liege, in the French-speaking part of Belgium. Unlike the light and fluffy Belgian waffles that are more common in the US, Liege waffles are denser and sweeter. 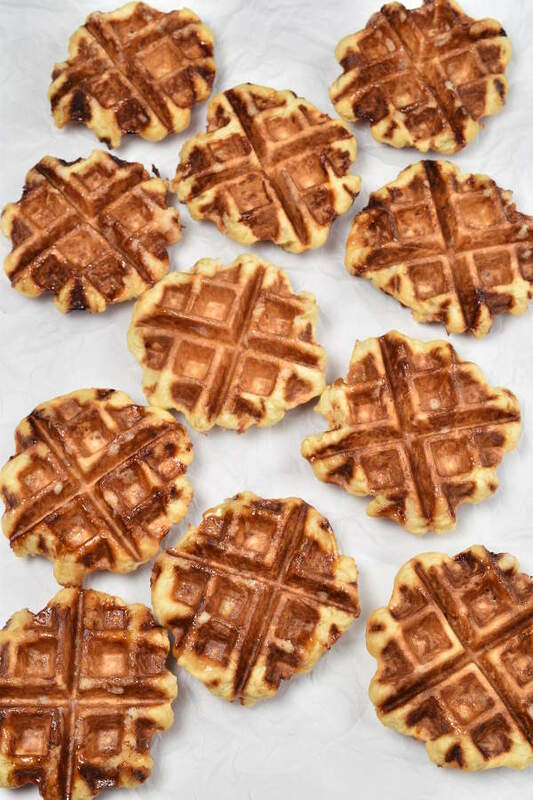 Liege waffles are made with a dough rather than a batter. They are sweet enough to eat without any maple syrup or other toppings. Liege waffles are popular all over Europe and commonly sold by street vendors as more of a snack food than a breakfast food. I remember when my sister and I were in Paris visiting with her friend who was doing a study abroad, she brought us to this snack stand by the Eiffel Tower to get Liege waffles. We had them drizzled with Nutella. I don’t think you can get a better snack. I’m getting so hungry just writing about these waffles. One piece of advice: Don’t get Nutella on your waffle if you’re going to be eating it with mittens on. Too messy. Also, make sure you carry some cash on you when you’re skiing because some of them are cash only. We also saw a pop-up shop selling Liege waffles next to an ice-skating rink in Cambridge once. They did something to make the smell carry across the ice rink so it was impossible not to buy a waffle. Jonathan and I enjoyed that so much. I knew it was only a matter of time before I made them at home. What is Belgian Pearl Sugar? Belgian pearl sugar is a key ingredient of Liege waffles. Belgian pearl sugar is a type of compact sugar formed into balls the size of small pebbles. It is made with beet sugar instead of cane sugar. Think like sugar cubes but in smaller, irregular shapes. This type of sugar is resistant to melting, and it’s a necessary ingredient to get those crunchy pockets of sugar throughout your waffles. The waffles are not the same without it. It took me a while to make these waffles because my supermarket doesn’t sell pearl sugar. I’m always a little resistant to recipes requiring special ingredients. I finally took the plunge and added this onto an Amazon order. It was well worth it. The first time I made Liege waffles, I used the recipe on the back of the pearl sugar package. The instructions were not very detailed, and I don’t think the waffles came out quite right. I mixed the dough by hand instead of using a stand mixer, and I used melted butter mixed into the dough, basically mixing all the ingredients at once. The waffles were good but they were denser than they’re supposed to be and not flaky inside at all. Then I did some online research and realized the dough is supposed to be basically a brioche dough. So I turned to brioche recipes. There are probably as many different ways to make brioche as recipes online. And I have seen recipes for no-knead brioche using melted butter so I wasn’t that far off, but I realized the waffles are lighter and flakier using a more traditional method. I took a couple shortcuts though. 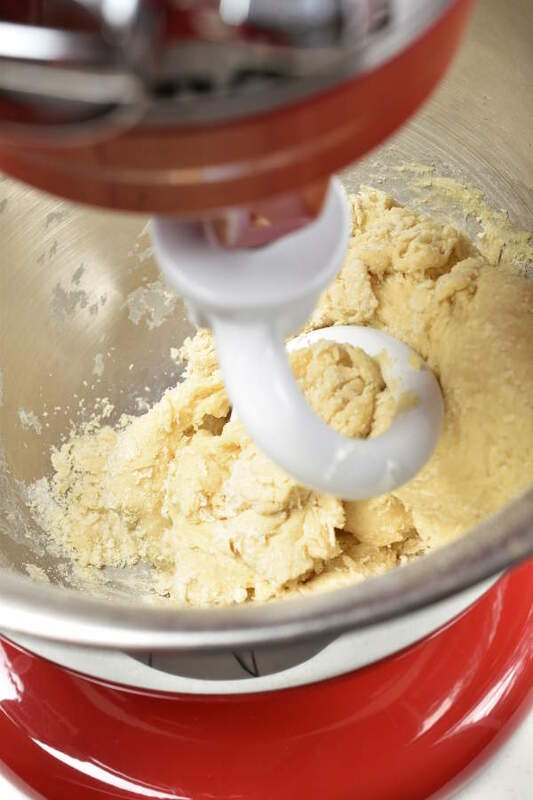 Instead of kneading one tablespoon of softened butter into the dough at a time, I added it to the mixer all at once. I also decided that I wanted to do only one rise, instead of two. Many brioche recipes call for two rises, but I wanted to see if I could get away with one to keep it a bit simpler. I’m very happy with how the waffles came out using this recipe. How Long Does it Take to Make Liege Waffles with Yeast? Here’s where the 2 hours, 50 minutes cook time comes from. First, it will take about 30 minutes to get the dough ready to rise. Next, it will take about 1 hour, 30 minutes for the dough to rise. The last 50 minutes is to cook the waffles. If you have a waffle maker that makes 4 square waffles, you can probably cook 4 waffles at once. Just place a ball of dough in the middle of each square. Your waffle cook time will go much faster. Because I used a circular Belgian waffle maker, I could only cook one waffle at a time. With 11 waffles and 4 minutes per waffle, it takes at least 44 minutes to cook all the waffles. You can also scale down the recipe or freeze some of the balls of dough to cook later. Here are the ingredients. 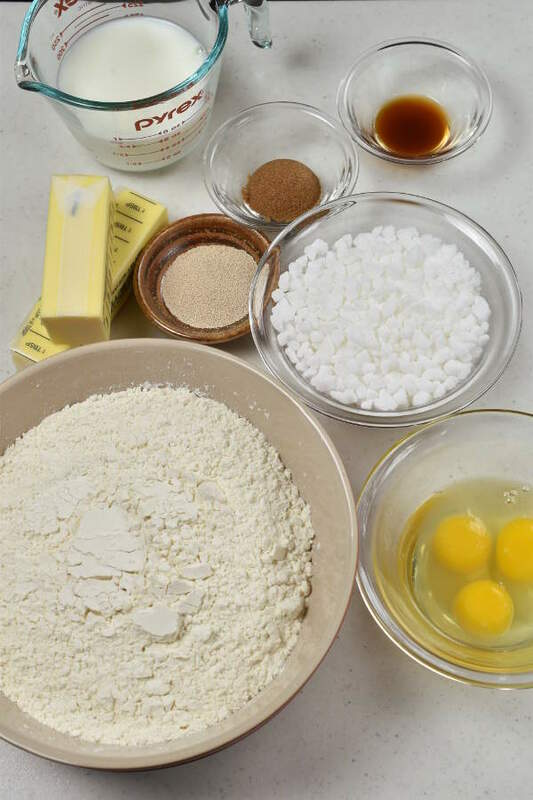 That’s all-purpose flour, eggs with an extra yolk, Belgian pearl sugar, active dry yeast, butter softened at room temperature, 2% milk, brown sugar, and vanilla. It might look like too much pearl sugar for the recipe, but the pearl sugar is essential for giving these waffles their pockets of crunch in every bite. Resist the urge to reduce the amount of sugar. First, mix warm milk with brown sugar and yeast. Wait 10 minutes for the yeast to get frothy, like this picture. Next, add the eggs, egg yolk, and vanilla. Then add flour and knead with the dough hook. Here’s what it looks like (before the butter is added in). 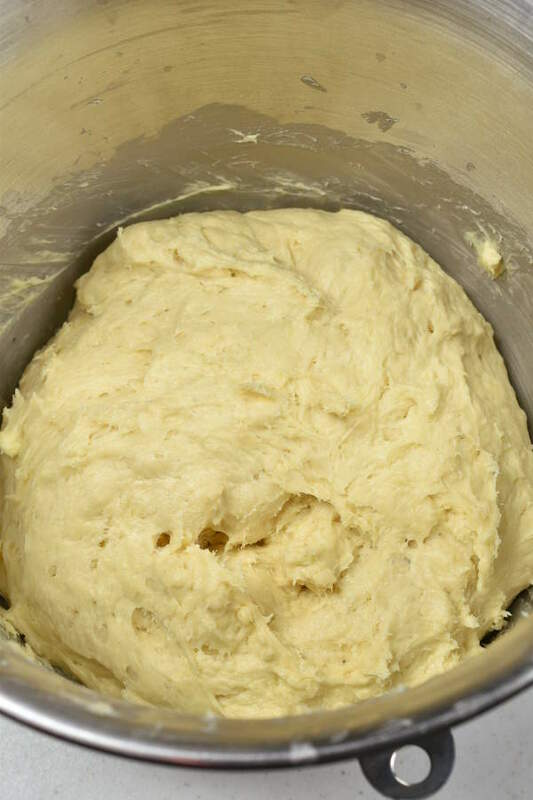 Then add the butter and continue kneading until it’s completely incorporated into the dough. This can take 5-10 minutes. The dough will be very sticky. Here’s a picture. 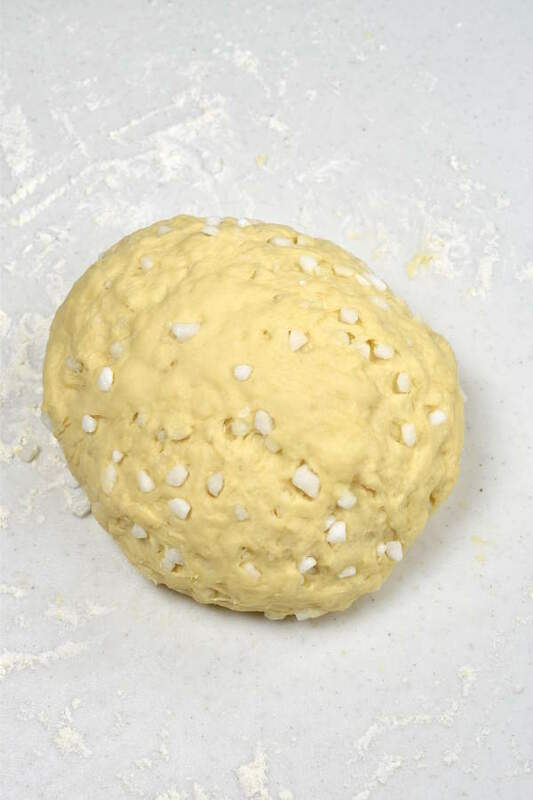 After the dough is done rising, flatten it a little into a circle shape, then add the pearl sugar. It’s going to look like too much sugar, but don’t reduce the amount. Knead in the sugar by hand until it’s evenly incorporated into the dough. 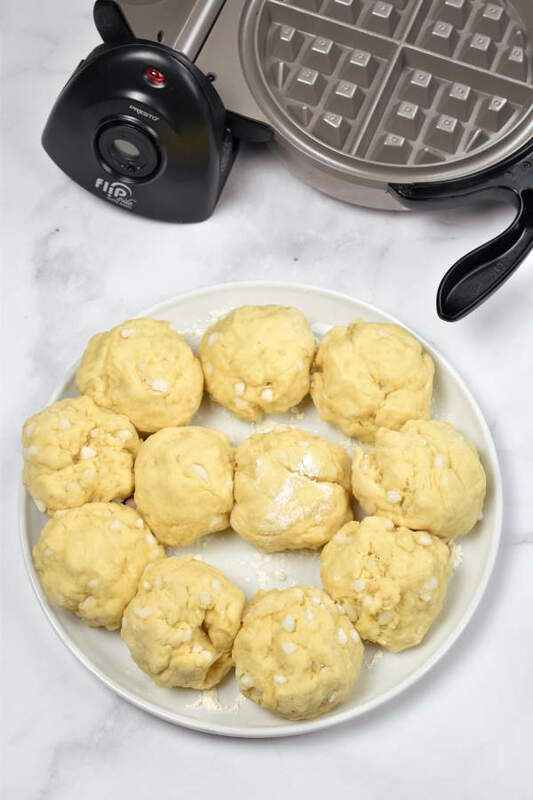 Next divide the dough into individual pieces, about 3 to 4 ounces each, and get your waffle iron ready. All that’s left is to cook the waffles according to your waffle iron instructions. Be careful handling the freshly cooked waffles because the melted sugar is very hot and can burn you. Believe it or not, I don’t like maple syrup on these waffles. The waffles are already very sweet to begin with, and I think syrup would compete with the vanilla and caramelized sugar flavor. As much as the waffles are delicious on their own, I’m not opposed to drizzling them with melted chocolate or Nutella. 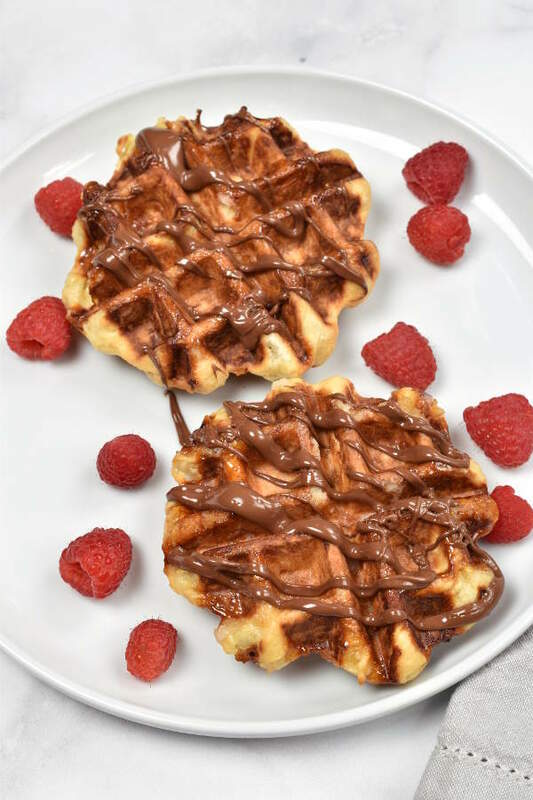 Chocolate complements these waffles without competing with the flavors. While there’s nothing wrong with slathering on a blob of Nutella, I recommend microwaving your Nutella for about 20 seconds so you can easily drizzle it over the waffles in a pretty design. Fresh berries are also a way to add color and add a refreshing contrast to the sugar. You can reheat leftover waffles in a 350 degree oven for about 8-10 minutes. 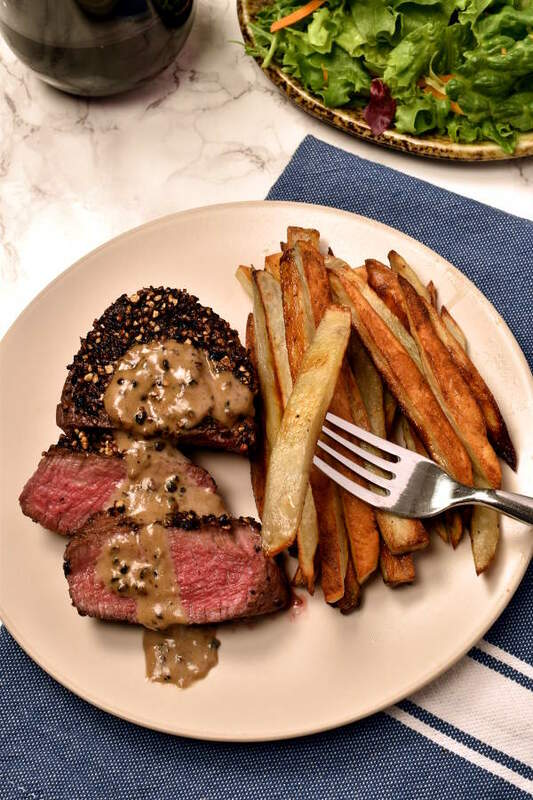 Reheating from the fridge or from the freezer takes about the same amount of time. Reheating from the fridge one day after I made them, they were still as delicious as fresh. When I reheated them from the freezer a couple weeks later, they were still very enjoyable but not 100% the same as fresh waffles. They are best eaten fresh. The first time I made these waffles, it was a mild disaster. Even though none of the waffles burned, there was burnt sugar stuck in every nook and cranny of the waffle iron. I even wrote an e-mail to my mom about it and swore I was never going to make them again. But I just couldn’t stop thinking about these waffles. If your waffle iron has removable plates, I wouldn’t worry about it at all. Burnt sugar will come off very easily with a soak in hot soapy water. If your waffle iron does not have removable plates, like mine, it may be slightly more challenging. What I did is while I was cooking the waffles, between each batch, I ran a Q-tip along the grooves. It picked up all the melted burnt sugar and I just threw it out. If you do this, be very careful because that melted sugar is hot enough to burn you. At the end, it was a lot easier cleaning. I was able to mostly wipe off the sugar with a damp towel and get most of it out that way. I hope I haven’t scared you away. Just look at these waffles and tell me you’ll give them a chance. Put milk in a glass measuring cup or other microwave-safe container and microwave until milk is warm, but not too hot. 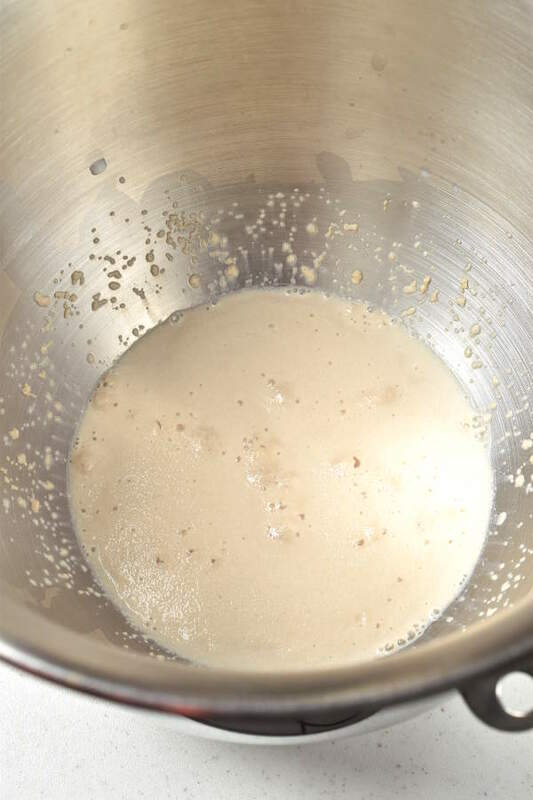 Add milk, brown sugar, and yeast to the bowl of a stand mixer. Stir by hand to combine. Wait 10 minutes, or until yeast is frothy. Add eggs, egg yolk, and vanilla and stir by hand to combine. Put the dough hook attachment on your mixer. Add 3 1/2 cups flour to bowl and mix with the dough hook (should be on speed 2 for KitchenAid) for 3-4 minutes, until dough comes together into a ball. Scrape down the sides halfway through mixing. Cut the butter into 2 tablespoon-sized chunks (7 pieces). 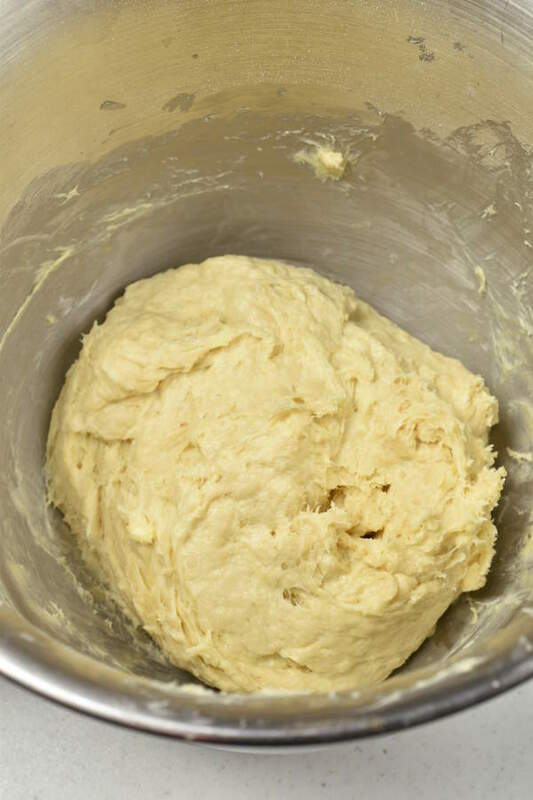 Add butter to the dough and continue to mix with the dough hook on low speed until butter is completely combined into the dough. This will take 5-10 minutes. Scrape down sides as needed. The dough will be very sticky. Cover bowl with plastic wrap. 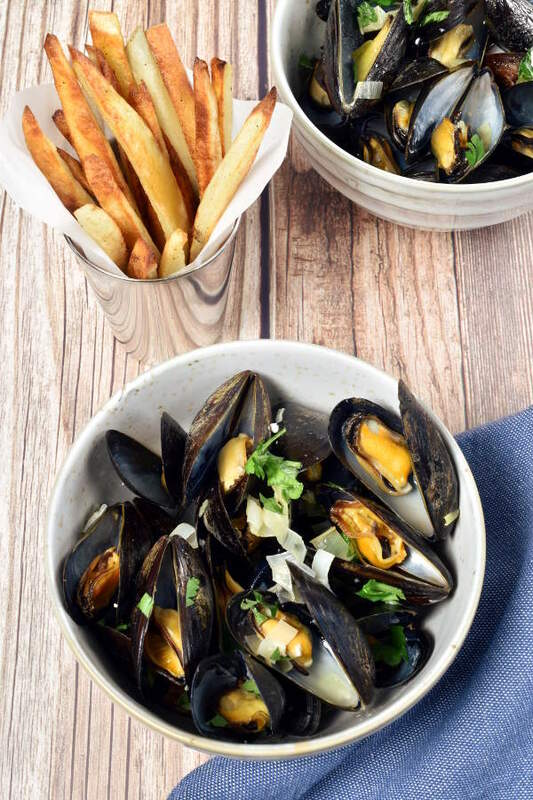 Let rise in a warm place at room temperature until doubled in size, about 1 ½ hours. Dust a workspace with flour and flour your hands. Empty dough onto workspace. Flatten ball of dough into a circular shape. 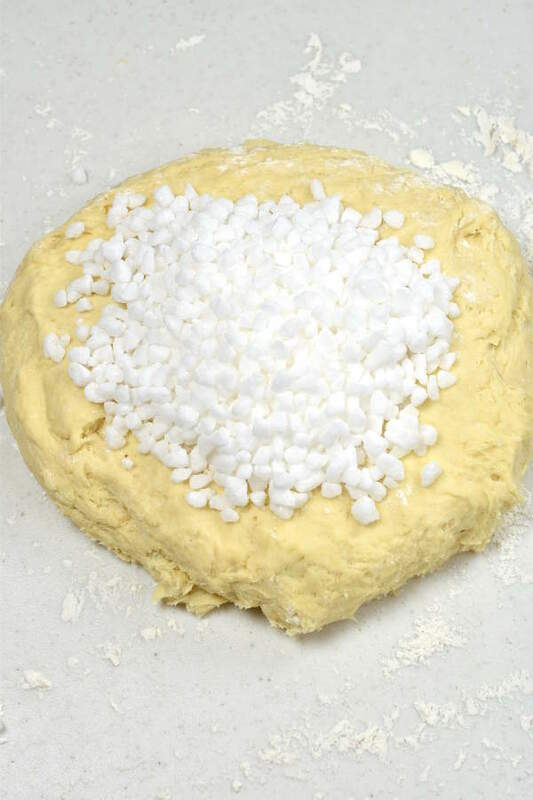 Add all the pearl sugar to the middle of the dough. Fold over and knead by hand until the pearl sugar is incorporated throughout the dough. Divide the dough into individual pieces (1 for each waffle). Each waffle should use 3-4 ounces of dough. I measure out the first few with a scale and then eyeball the rest. Roll each piece into a ball and place on a lightly floured plate. Preheat waffle iron. Grease waffle iron only if indicated by manufacturer’s instructions. Cook each waffle according to waffle iron instructions. I used a nonstick ceramic Belgian waffle maker, and it took about 4 minutes per waffle. If you notice sugar burning at any point, unplug the waffle iron to let it cool down before continuing. After each waffle is cooked, place in oven to keep warm until ready to serve. Be careful handling cooked waffles – the melted caramelized sugar is very hot. That’s interesting that you need that specific type of sugar or the waffles won’t be quite the same. I’ve never heard of pearl sugar before. I didn’t know that they make it with beet sugar as well. I’ll have to try some of there sometime since they sound awesome. Thanks Tyler. 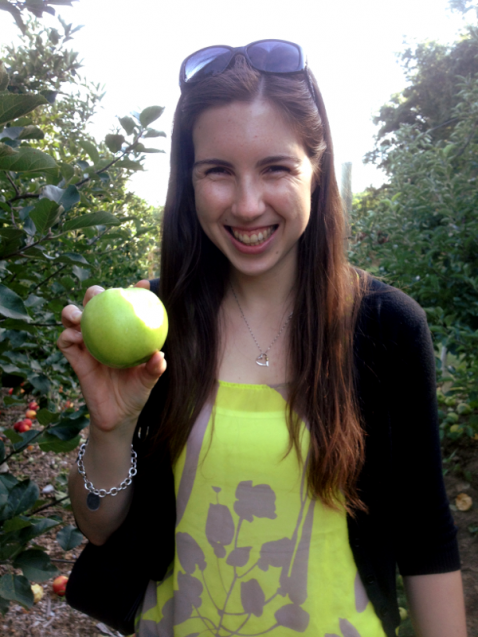 It’s worth tracking down the pearl sugar!